Great Frigatebird: a typical view of this bird, from below. Michaelmas Cay is a small vegetated coral cay which is a protected seabird sanctuary. This report provides some general information about Michaelmas Cay on the Great Barrier Reef - a birding site usually visited when you travel to Cairns. 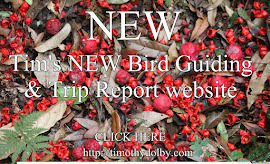 It provides a summary of the birds seen on a recent trip to the Michaelmas Cay. Michaelmas Cay is a major seabird nesting island in the northern Great Barrier Reef. 1.5 ha in area, and 3.5 m high, it lies 43 km north-east of Cairns (-16.606321, 145.973792). It sits on the western tip of Michaelmas Reef; a mid-shelf reef formed by living coral animals, polyps which secret a limestone skeleton. Brown Booby: several birds seen at sea. Great Frigatebird: four birds seen, high in the sky. 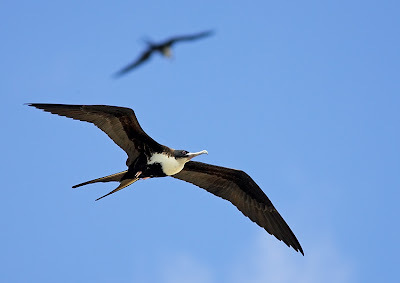 Lesser Frigatebird: two birds seen, high in the sky. Silver Gull: three birds seen. Common Noddy: literally thousands seen. Gull-billed Tern: several on the way out to the Cay. Lesser Crested Tern: only a few birds seen. Caspian Tern: several birds seen. Black-naped Tern: a dozens seen near highest point of Cay. Ruddy Turnstone: three birds seen. Little Tern: several birds seen fishing at sea. Roseate Tern: several roosting birds. 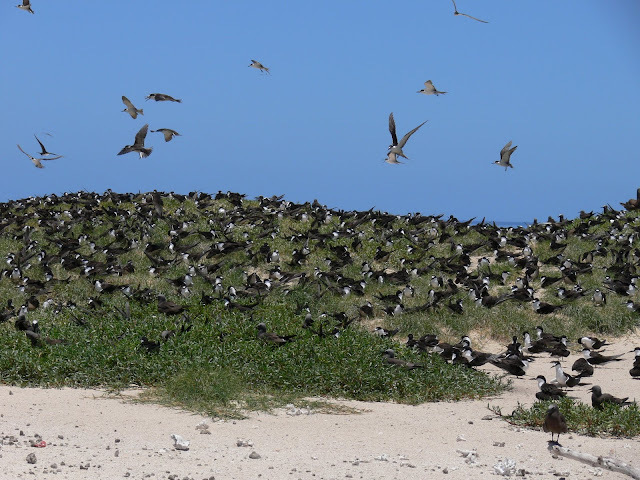 Overall 38 species of birds have been recorded on Michaelmas Cay - 35 seabirds and 3 woodland species. The main breeding species are Sooty Tern, Crested Tern, Common Noddy and Lesser Crested Tern. Occasional breeders include Silver Gull, Black-naped, Bridled and Roseate Tern, Black Noddy and Ruddy Turnstone. Other birds less commonly recorded birds include Southern Giant-Petrel, White-tailed Tropicbird, Masked and Red-footed (rare) Booby, Curlew Sandpiper, and Pomarine and Long-tailed Jaeger. 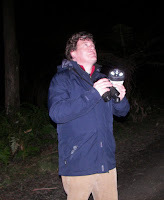 In 2005 a group of Fairy Tern were also recorded, possibly a new race for Australia. In the sheltered areas behind the sand bank, seeds carried by birds flourished and stabilising the cay. Bird droppings fertilize the sand, creating a large grassy that now covers the centre of the cay. Some of the common plants here include Hairy Spinifex (Spinifex hirsutus), Stalky Grass (Lepturus repens) and Sea Purslane (Sesuvium portulacastrum). Also don't forget that Michaelmas Cay is surrounded by some magnificent coral reefs! I can highly recommend that when you travel at Michaelmas Cay that you take time to go snorkeling. Nearly two million years old and world heritage listed in 1981, the Great Barrier Reef has an amazing 1,500 species of fish. For instance, the boat to Michaelmas Cay usually stops off at nearby Hastings Reef (-16.519771, 146.016370). Consisting of reef edges and back reef sand floors, Anemones and clumps of Staghorn Coral are a features of the reef, while Giant Clam perch on the shallow reef top and bommies. Some of the fish you may see include Clown Anemonefish (Nemo), Sweetlip, Cod, Trout, Butterflyfish, Angelfish, and schools of Damsel, all feeding among the coral and adding amazing splashes of colour to the reef. When I travelled to the Michaelmas Cay I went on the Sea Star 2, a great service because it was relatively cheap when compare to similar boat trips. Unfortunately this service finished in 2007. The cheapest option now is to catch the Passions of Paradise (run by the same people), which costs about AUS$130pp. Contact Seastar Cruises, http://www.seastarcruises.com.au/. An alternatively to this is to catch the Ocean Spirit for AUS $189pp, kids $94pp, see http://www.oceanspirit.com.au/. Before you get to the cay, make sure to let the crew know that you want to go ashore to go birdwatching - they are usually more than happy to help.